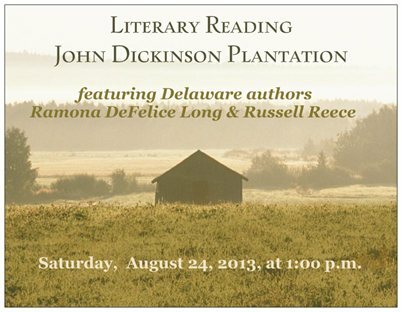 Saturday, August 24, 2013 at 1:00 p.m.
Join two local authors representing the Delaware Division of the Arts’ Individual Artist Fellowship Program for a literary reading at the home of one of the state’s most treasured historical figures. Ramona DeFelice Long of Newark and Russell Reece of Bethel will share stories and discuss the value and impact of place in their writing. Following the reading will be a site tour and colonial craft. John Dickinson Plantation is located at 340 Kitts Hummock Road, Dover, Delaware. This program is free and open to the public. It is made possible, in part, by a grant from the Delaware Division of the Arts, a state agency dedicated to nurturing and supporting the arts in Delaware, in partnership with the National Endowment for the Arts and with support from the Delaware Division of Humanities and Culture. This entry was tagged Delaware Division of Humanities and Cultural Affairs, Delaware Division of the Arts, John Dickinson Plantation. Bookmark the permalink. Congratulations, Ramona! It sounds like a wonderful day. You know, I should have made plans to go up there for this. It looks like fun!